For many individuals, picking out their next rug or “member of the family” requires a lot of time, thought and planning. Families can also acquire rugs from members of their family having been handed down for generations. Others are purchased as design pieces for their home to add color, style and elegance. But do you ever think about rug cleaning for these beautiful pieces? 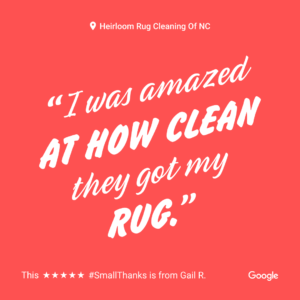 At Heirloom Rug Cleaning of NC in the Durham and Greensboro areas, we view them as works of art that deserve the best quality cleaning and service. That’s why we’ve taken extra time developing our cleaning processes to ensure the best deep cleaning possible and completely safe for any rug. Whether it’s a Hand Woven, Tufted, synthetic, Turkish Kilim, Afghan, Indian, Persian, or Viscose, we have the expertise to handle your rug cleaning needs. This expertise gives our rug owners the benefit of knowing their rugs are being handled by knowledgeable and caring individuals. We’ve traveled extensively learning best practices from some of the giants in the cleaning industry. Your rug is a member of your family, and it deserves the best attention and service possible. That is why we brought home the knowledge we gained and apply it to your rugs in the triangle and triad areas. Our process starts with the pre-inspection report. Here we look to see what the fiber type, construction and whether a rug may “bleed” during cleaning. We also look for problem areas such as “buckling”, “browning”, “abrash” and many others. We take pictures for identification and e-mail the owner with any concerns, giving the owner piece of mind knowing they are included in the cleaning process. After, we perform a “bleed” test to see what course of action we need to undergo for proper and safe cleaning. Once the determination is made, we then place the rug in the proper area to begin the cleaning process. The rugs are vacuumed front and back removing the dry soil and particulates first before going to the next phase which is our dual-stage dusting. Here the rugs are laid face down and we use a duster to go over the backs knocking out dust particulates that a vacuum cleaner can’t get. Most companies stop here, but we then flip the rugs over and do an “air dusting” to get rid of all dry soil and particulates possible before moving onto the next phase. The benefit to the rug is substantial, our dual-system approach removes more dry soil than any other system on the market today. Rugs that are determined not to bleed are placed in a “bathtub for rugs”, to begin the soaking process. We leave them “marinating” in the tub until the desired results are accomplished. For the bleeders, we have a different process for the first step. We then remove the rugs from its marinating source and lie it down to shampoo the rug. We have counter rotating brushes that run across the rug to give it a good scrubbing which helps bring the vibrant colors back to life. Here is when the fringes are given their attention. The rug is then rinsed, wrung out, then rinsed again. Any specific areas that are needing additional attention is then addressed at this point. The rugs are then rinsed, softener applied and then dried out depending upon construction type. After we extract majority of the water, the rugs are placed on hanging racks in a temperature controlled drying room. We monitor the progression and remove the rugs once their properly dried. If this cleaning process sounds like something your rugs need then give Heirloom Rug Cleaning a call! We have two service areas to fulfill all of our customers. Triangle Area serving the Raleigh, Durham, Chapel Hill and surrounding areas can be reached at 919-224-9547, and the Triad Area serving Greensboro, Winston-Salem, and High Point can be reached at 336-267-6614.